Where did Wiener go wrong? As a part of my work on the "Can we know what to do about AI?" project for MIRI, I looked at mathematician Norbert Wiener&apos;s predictions about the impact of automation on society, and how he acted based on these predictions. I already wrote about Wiener&apos;s "Sorcerer&apos;s Apprentice" type concerns about the dangers of automation, which parallel MIRI&apos;s concerns and Eliezer&apos;s concerns about AI risk. But Wiener was also concerned that automation would cause unemployment. Coincidentally, immediately after I investigated this, Eliezer wrote The Robots, AI, and Unemployment Anti-FAQ, which argues against the position that Wiener held. I found a recent paper titled Some Notes on Wiener’s Concerns about the Social Impact of Cybernetics, the Effects of Automation on Labor, and “the Human Use of Human Beings” which summarizes Wiener&apos;s views on automation and unemployment and how he acted based on them. Early in the postwar period, Wiener began an active outreach to organized labor. He made contact with union leaders, but he could not impress union officials the seriousness of the challenges posed by automation. The experience left him frustrated and strongly suspecting that labor leaders had a limited view of the coming realities of automation and few tools for dealing with his larger questions about the future of labor itself. Wiener’s outreach to labor never resulted in the coordinated planning and struggle he knew would be needed to prepare societies for the coming age of automation. And, beginning in the 1960s, the numbers of American industrial workers began their historic decline. In the first wave, more than a million factory workers lost their jobs to automation, including 160,000 members of Walter Reuther’s United Automobile Workers union. However, at a macro-level, and over large time scales, automation doesn&apos;t seem to have increased unemployment nearly as much as Wiener seems to have believed. The graph of unemployment from 1950 until present gives the impression that at the time when Wiener expressed his concerns, unemployment hovered around 6%, whereas in later decades it&apos;s hovered around 7%. It&apos;s interesting that there appears to have been a slight increase, but this could be attributable to outsourcing to foreign countries rather than to automation, and the absolute unemployment rate is very low compared with the 20% unemployment rate from the Great Depression. Conventional economic theory says [long term unemployment due to automation] shouldn&apos;t happen. Suppose it costs 2 units of labor to produce a hot dog and 1 unit of labor to produce a bun, and that 30 units of labor are producing 10 hot dogs in 10 buns. If automation makes it possible to produce a hot dog using 1 unit of labor instead, conventional economics says that some people should shift from making hot dogs to buns, and the new equilibrium should be 15 hot dogs in 15 buns. On standard economic theory, improved productivity - including from automating away some jobs - should produce increased standards of living, not long-term unemployment. [A] common pattern [is]: project forward a current trend to an extreme, while assuming other things don’t change much, and then recommend an action which might make sense if this extreme change were to happen all at once soon. At least with the benefit of hindsight, Wiener&apos;s predictions appear naive. Wiener seems to have gone wrong in relying on one relatively strong argument as opposed to many weak arguments. The argument "if machines start doing the labor that low skilled workers are qualified to do, then their employers will fire them, and they won&apos;t have jobs" may have seemed strong from the inside. But arguments that feel strong from the inside are often wrong. Wiener could have done better by giving more weight to conventional wisdom, by trying harder to understand why others didn&apos;t share his concerns (which might have resulted in more exposure to conventional economic theory), and by doing a more detailed study of the historical impact of technological innovations on employment. Being multidisciplinary — Incorporating ideas from different disciplines. Being empirical — Relying more on observation than on theory. If Wiener had approached the question of whether automation will lead to large scale unemployment in a more multidisciplinary and empirical way, he might have made a better prediction. The unemployment rate doesn't accurately represent this. 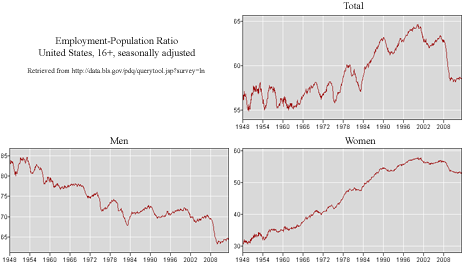 I'd say labor force participation rate in males is a more accurate reflection of the underlying issue. Male labor force participation rate in the US has declined from 87.5% to 70% from 1950 to present, per federal reserve bank of St. Louis. I've sent them a query to get their exclusionary criteria for the base male labor force pool. Me, I'm with Wiener. His worries were ahead of his time, as people in the 50s and 60s expected household robots around the corner. People underestimated how hard general purpose AI would be. But between computing power, sensors, and improved algorithms, we're starting to turn the corner. No mechanical Minnie the Maid yet, but automowers, roombas, automatic fruit pickers are economically viable for some, and will only get more and more so as time goes on. I'm disappointed in EY's economic analysis, as it ignores all the frictional costs in hiring. Yes, if you ignore such things, by relative advantage arguments everyone who wants a job has one. Since that is observably not the world we live in, those costs are clearly relevant to the analysis. Also, the wage under that perfectly efficient system may be a penny an hour. Not everyone will be economically viable under all conditions. Horses used to be economically viable as productive members of the work force, or productive tools, if you prefer. Now they're mainly economically viable as pets or dinner. Most people don't want either occupation. We're still recovering from a recession — the rate was ~73% before the recession. Since 1950 high school completion has increased from ~ 55% to 80% and college completion has increased from ~ 5% to ~ 25% so there are more students nowadays. Since 1950, female participation labor force participation rate has increased by ~ 25 absolute percentage points, lessening the need for the male head of household to work. Since 1950, life expectancy for men has increased from 66 to 76, and labor force participation rate of 65-75 year olds is unrepresentatively small, at about 30%. Automation could reduce the cost of hiring. I don't see why one would expect the frictional cost of hiring to push against hiring human workers at equilibrium. Workers wouldn't be willing to work for 1 cent an hour, so the wage under a perfectly efficient system would have to be higher than 1 cent an hour. There could be a Malthusian type scenario where everyone is working really hard just to have a life barely worth living. But this is separate from the unemployment issue. Take Uber, Sidecar, and Lyft as examples. I can't find any data, but anecdotally these services appear to reduce the cost, and increase the wages, for patrons and drivers respectively by between 20 and 50%, with increased convenience for both. You know it's working when entrenched, competing sectors of the industry are protesting and lobbying. Eliezer's suggestion about forgotten industries (maids and butlers) seems much more on point if automatic markets can remove hiring friction. Ride sharing has a rapidly-converging rating system that, with high-success, pairs drivers and riders, a paradigm that seems like it could succeed elsewhere with (if slow) changes in legality and public perception. Twenty years ago it would have nothing but incredible to not hold in your hand items costing a month's wage before buying them and waiting two days for them to appear on your doorstep. If there's a coming analogous revolution for the workforce, it could be even shorter, which puts it far out of reach of major AGI advances. Twenty years ago it would have nothing but incredible to not hold in your hand items costing a month's wage before buying them and waiting two days for them to appear on your doorstep. This first catalogue was a single sheet of paper with a price list, 8 by 12 inches, showing the merchandise for sale and ordering instructions. Montgomery Ward identified a market of merchant-wary farmers in the Midwest. Within two decades, his single-page list of products grew into a 540-page illustrated book selling over 20,000 items. From about 1921 to 1931, Ward sold prefabricated kit houses, called Wardway Homes, by mail order. Unless of course you were putting your emphasis on 2-day mailing. I suspect Ward couldn't sell you a new house and deliver it in 2 days. Based on the quotes you give, I feel you're being uncharitable to Wiener here by talking as if his prediction had been falsified empirically. It has not; what he calls "cybernetic revolution", in which the human brain itself would be devalued, hasn't really happened yet. So far, what's been devalued is mostly human limbs, if you will. The impression that I got is that he had a pretty short time scale in mind (i.e. to the point that he was working with labor unions in the present day). One could argue that he believed that AI would develop faster than it has, or that he thought that networking with labor unions in the present would be useful for preventing problems 50+ years down the road. I think that the extent to which the human brain has become replaceable is debatable. I think that there are a lot of tasks that people would have characterized as cognitively demanding at the time have now been automated (e.g. getting and understanding travel directions used to be more cognitively demanding than it is now, supermarkets have automated checkout stations). It has long been clear to me that the modern ultra-rapid computing machine was in principle an ideal central nervous system to an apparatus for automatic control; and that its input and output need not be in the form of numbers or diagrams but might very well be, respectively, the readings of artificial sense organs, such as photoelectric cells or thermometers, and the performance of motors or solenoids. With the aid of strain gauges or similar agencies to read the performance of these motor organs and to report, to "feed back," to the central control system as an artificial kinesthetic sense, we are already in a position to construct artificial machines of almost any degree of elaborateness of performance. The modern industrial revolution is similarly bound to devalue the human brain, at least in its simpler and more routine decisions. Of course, just as the skilled carpenter, the skilled mechanic, the skilled dressmaker have in some degree survived the first industrial revolution, so the skilled scientist and the skilled administrator may survive the second. However, taking the second revolution as accomplished, the average human being of mediocre attainments or less has nothing to sell that it is worth anyone’s money to buy. My impressions are largely primarily from Some Notes on Wiener’s Concerns about the Social Impact of Cybernetics, the Effects of Automation on Labor, and “the Human Use of Human Beings” (though I did spend some time looking at other sources). Do you think that other sources give a different impression? which gives the impression of urgency (a sense that he viewed it as a high priority and time-sensitive issue). Capable of what? Some tasks that previously required labor of humans of average intelligence have been automated, and others haven't been automated. There's still an abundance of jobs for people of average intelligence that pay above-minimum wage. The first paragraph that you quote gives the impression that he may have (mistakenly) thought that humans were on the brink of developing robotics that are sufficiently sophisticated to replace physical labor. But robotics don't suffice to replace all desired labor that humans of average intelligence are capable of. Do you think that other sources give a different impression? To arrive at this society, we need a good deal of planning and a good deal of struggle, which, if the best comes to the best, may be on the plane of ideas, and otherwise – who knows? I thus felt it my duty to pass on my information and understanding of the position to those who have an active interest in the conditions and the future of labor, that is, to the labor unions. I did manage to make contact with one or two persons high up in the CIO, and from them I received a very intelligent and sympathetic hearing. Further than these individuals, neither I nor any of them was able to go. Capable of any job that a human of average intelligence could perform. I thought that's pretty clear from "However, taking the second revolution as accomplished, the average human being of mediocre attainments or less has nothing to sell that it is worth anyone’s money to buy." The first paragraph that you quote gives the impression that he may have (mistakenly) thought that humans were on the brink of developing robotics that are sufficiently sophisticated to replace physical labor. Complete subservience and complete intelligence do not go together. How often in ancient times the clever Greek philosopher slave of a less intelligent Roman slaveholder must have dominated the actions of his master rather than obeyed his wishes! Similarly, if the machines become more and more efficient and operate at a higher and higher psychological level, the catastrophe foreseen by Butler of the dominance of the machine comes nearer and nearer. Based on your quotation, I agree. I was reporting on what I read, and didn't deep dive the situation, because I came to the conclusion that the case of Wiener and automation doesn't have high relevance. We have a difference of interpretation. I thought he wasn't talking about AGI because AGI could probably replace high intelligence people too, and he suggests that high intelligence people wouldn't be replaced. I think that he was writing about narrow AI in his earlier writings, and AGI in his later writings. If you break down employment by sector, hasn't manufacturing employment steadily decreased since about the 1960s, while manufacturing output has increased (i.e. the productivity gains and job losses come from automation, not globalization)? I think that the real automation concern is reduced employment prospects for specific sections of the population, not long-term involuntary unemployment. When the union manufacturing jobs go away and you get a job at Wal-Mart instead, you can still pay rent and eat food- but you've moved from lower middle class to lower class, which has a number of troubling secondary effects. Historically, automation has resulted in wealth skewing. Some resources such as land are zero-sum, and so wealth skewing has negative humanitarian impacts. But automation also has benefits to people at the bottom of the wealth distribution. Even though automation has made things worse for some people by reducing the status and pay of their jobs, the holistic effect on the bottom 50% of the wealth distribution (say) seems likely to be positive. A much better title would be "Norbert Wiener on Automation and Unemployment." It's not clear that Wiener here was considering AI at all. I changed this per your suggestion. It certainly seems like he considered it, at least on a basic level, enough to be extrapolated. See my response to buybuydavis.